Our vac truck services are available 24-7, 365! Experienced, punctual and professional, Northern Vac has a variety of options for you to consider. 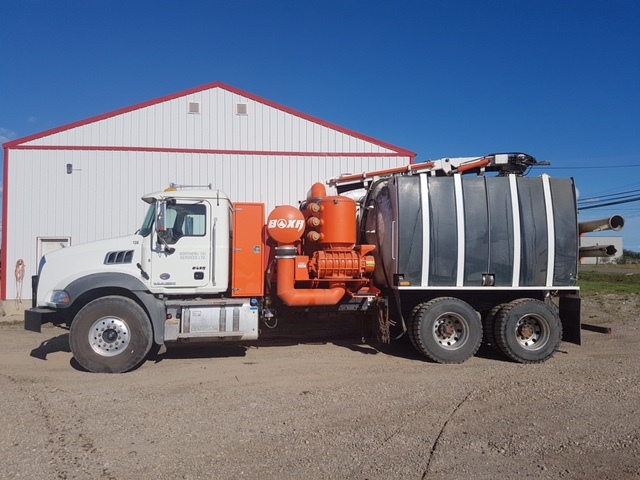 From oil patch services to restaurant grease trap cleaning, septic fields and flooding, or agricultural and industrial applications, our team is standing by to help you clean up quick or adequately prepare your job site. Storm drains, sewer lines, catch basins, culverts…one call does it all when you call Northern Vac Services in Fort St. John. Hydro Excavation relies on pressurized water and a superior vacuum system to safely and non-destructively expose infrastructure underground. This specialized method of digging is preferred throughout many industries, including construction, along with oil and gas. High pressure water is injected into the site with a special wand. Once the soil is liquefied, the slurry is extracted with the vacuum and transferred to the debris tank onboard the hydrovac. Our trucks can work in every type of terrain including clay. Thanks to onboard heaters, hydrovacs are capable of digging into frozen ground for winter operations. We can work within tight spaces easily and efficiently. Excellent for industrial applications and the oil and gas industry, our combo vac units are ideal for industrial cleaning, thawing out frozen sewer lines, catch basins, culverts and storm drains. A centrifugal vacuum system works alongside the high-pressure water blasting to clear the way. Combo vacs can help you clear the way to prevent flooding and detrimental issues that arise when vital drainage access ways become plugged or clogged. Our industrial vac trucks have the capacity to take care of your liquid cleanup issues fast! Applicable for gas plants, pipelines, mud tanks, drilling rigs and more, we have decades of experience within a variety of applications in and around Fort St. John. Northern Vac Services has the crew and the equipment to help you clean up quick! Keep your crews safe and simplify tank cleaning once and for all. Avoid harsh fumes, chemical residue or cross-contamination by having Northern Vac Services handle your zero-entry tank cleaning. It can be dangerous and disastrous to send people into sludge filled tanks. Eliminate the possibility of chemical exposure or confined space entry and boost your safety factor. Our committed and experienced crew can help you get the job done efficiently and safely.